Love the pics. Their making me hungry. I like that you write in your cookbook. I know my favorite recipes are the ones with my mom's handwriting on them. Oh that batter looks so nummy! Your little guy looks like he should be in a Monster Cookie ad with that expression and the thumbs up! And I love the planning ahead so to dirty up the least amount of dishes! It was a lot of fun making these cookies with my kids. Yummy! I love cookies like these - with a little substance! 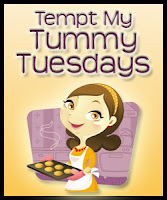 Welcome to Tuesday Tastes! Thanks for sharing such a tasty recipe! I am going to have to try these! :-) Love his expression and thumbs up in the last photo! Hi Heather, your blog was recommended to me, and I'm glad it was! I'll be back to visit, I'm your newest follower on Google. Your kids look like they loved every minute of making cookies with you!